Chocolate Pots de Creme is a name for a classic and elegant French dessert which means ‘The Pot Of Custard’ or ‘The Pot Of Cream’. The egg yolks make this recipe moist rich and creamy, and turn it into a finest and smoothest dessert that I could ever think of. This is almost like a chocolate pudding, but a thousand times better. Happy Choco-Tuesday to you guys! Sorry to make you feel bad by talking about my morning sickness during my pregnancy. Let’s cheer-up the mood of this conversation by talking about today’s recipe. It is ‘Chocolate Pots De Creme’. As you all know that I love chocolate. So any dessert or pudding made with chocolate is absolutely my favourite. Imagine a chocolate custard topped with whipped cream and fruits. Oh la la!! This is one of my favorite desserts. As an adult I turned into a sweet-toothed person. And I get happily satisfied if I get a chilled bowl of this decorous dessert at any time. I first made this dessert in 2010. But I had always wanted to make chocolate pot de creme for so long as it is one of Abhishek’s favourite desserts. He had asked many times to make this dessert then. It was AMAZING and Abhishek just loved it, and me too! There is a famous Indian proverb, ‘The way to a man’s heart leads through his stomach’ and I must say, every Indian girl would have heard this at least once. I completely believe in this. Even now whenever I want to please Abhishek, I would go for either Chocolate mousse, or Chocolate pots de creme. I know these desserts would win his heart. This dessert was something I have always fancied. I mean just listen to the name of this elegant dessert. Could there be anything more ROMANTIC than the French dessert as ‘Chocolate pots de creme’. Oh! Yum! I love everything with chocolate. I was so amazed when I tasted this rich creamy dessert during our visit to Paris in 2008. It is quick and easy to prepare and looks so delicate. I am sure there were many more which I could not recall now. You will surely love this easy & scrummy recipe. It’s rich, creamy and can be made three days in advance if you have guests coming. Perfect for relief on holidays’ hectic schedule. Especially, if you are time pressed and fighting for oven space. It’s also a great option for a pretty surprise. Just hide it deep inside the refrigerator and “forget” it for a couple of days. 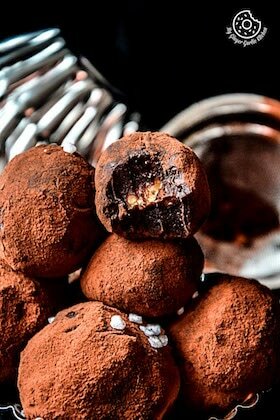 And then, enjoy your nice little chocolate surprise in the evening after a tiring day. Traditionally this dessert is served in beautiful little pots – hence the name ‘Pots De Creme’. The egg yolks make this recipe moist rich and creamy, and turn it into a finest and smoothest dessert that I could ever think of. This is almost like a chocolate pudding, but a thousand times better. There are baked and no-baked versions of this. Today I am sharing the baked version of this dessert. Why did I make it on weekend? For me this weekend seemed like a perfect day to make this silky dessert again. It was snowing cats and dogs here. Indeed so so cold outside, and it was a classic day just to watch the chocolate melting slowly in the milk and cream. There are only two things you need to consider while making these pots de creme. Buy the best chocolates you can buy. And try to use fresh eggs. These two ingredients are the shining stars of this recipe. I just love the show stopper fancy name of this dessert. ‘Chocolate pots de crème’ – the name sounds as if you have to be a certified French chef to make it. But that’s not true. You don’t need to be French for this. This is actually so easy to make. It only takes about 15-20 minutes to prepare and about an hour in the oven to cook it. Another 4-6 hours in the refrigerator to get the perfect temperature. 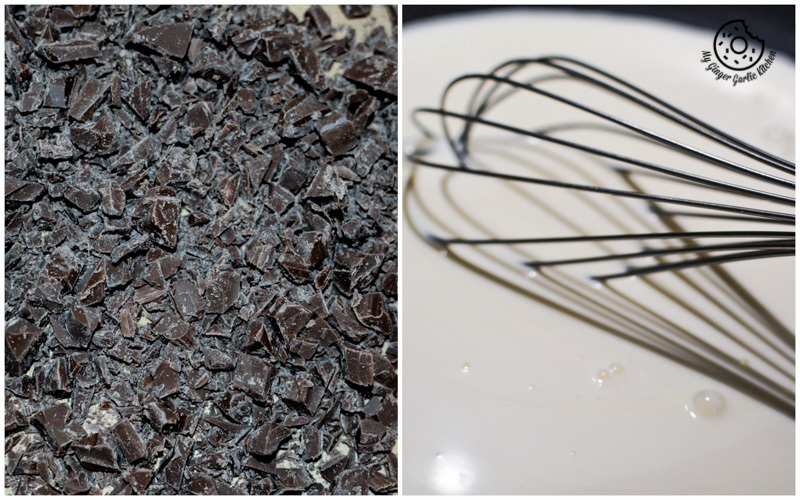 It has semisweet chocolate and somewhat similar to a mousse with a silky creamy texture. 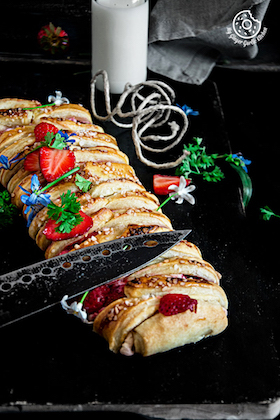 Let’s make this yummy dessert together! In a medium saucepan, combine the whole milk with the heavy cream and bring to a simmer over moderately high heat. Add chopped chocolate, and vanilla extract. Melt chocolate completely, and let it come to a boil. Turn the heat to low. Take a large bowl. 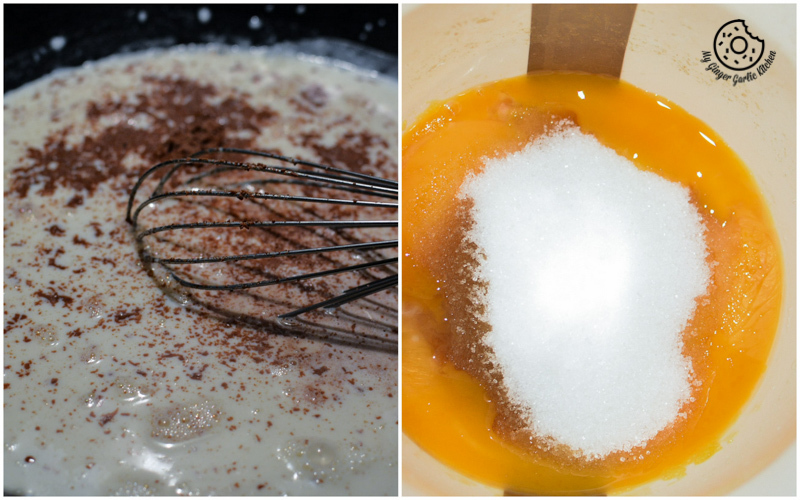 Add egg yolks, sugar, and salt to it. Beat them until combined. 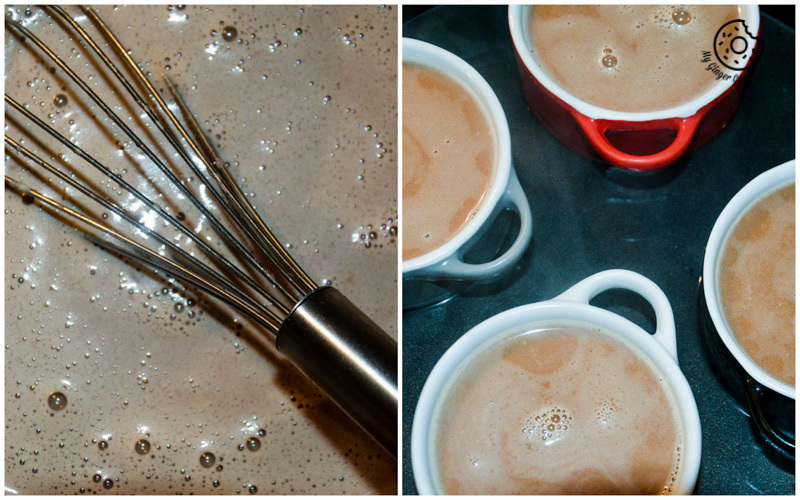 Slowly whisk egg yolks in the boiled milk chocolate mixture. To avoid any lumps, strain the mixture through a fine sieve into a large measuring cup or bowl. Take a large oven tray, and place the 4-6 oven proof bowls in this tray.Divide the chocolate mixture between the cups, and pour warm water into the tray to come halfway up the sides of the cups. Cover with the parchment paper. Place this tray in the preheated oven, and cook for 40-45 minutes. Take out the tray, and let the bowls cool completely. 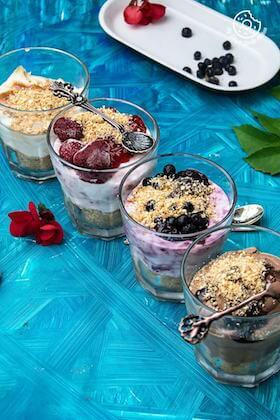 Cover each bowl with plastic wrap and refrigerate until the Chocolate pots de crème are chilled. This would take at least 4-6 hours or overnight. Serve the pots de crème topped with whipped cream and chocolate shavings, and fruits. 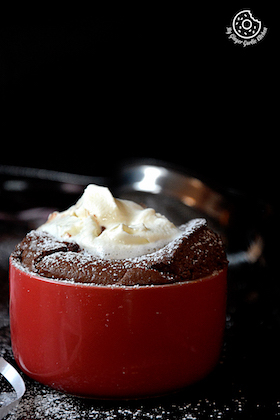 ‘Chocolate Pot De Creme’ is a rich, creamy, silky and smooth French dessert. The egg yolks make this recipe moist rich and creamy, and turn it into a finest and smoothest dessert that I could ever think of. This is almost like a chocolate pudding, but a thousand times better. Take a large oven tray, and place the 4-6 oven proof bowls in this tray. Pour the chocolate mixture into bowls. Pour some hot boiled water into the tray and cover with the parchment paper. Place this tray in the preheated oven, and cook for 30-45 minutes.